As I reflect on 2017, one of the things that's been on my mind this past year more than just about anything else is the importance of risk taking. I am on a mission to crush apathy, in my own practice, in our school, and for our students. And why is that so important to me? I can't think of anything that is more detrimental to the pursuit of excellence than complacency and apathy. In the first few years of an educator's career, it's tough to be apathetic. You are in survival mode. There is so much to learn. But for many, once there is kind of an equilibrium, it's easy to just settle into a comfortable groove and start coasting a little. The initial passion can wear off, and the easy thing to do is to get a little stale. For students, as the years wear on, engagement in school tends to decline. Far too many students are going through the motions, playing the game of school, and just getting by. The focus is often on getting a certain grade or achieving whatever level of success is acceptable to self and to parents, but the idea of passionate learning or the pursuit of self-mastery is completely lost on most. 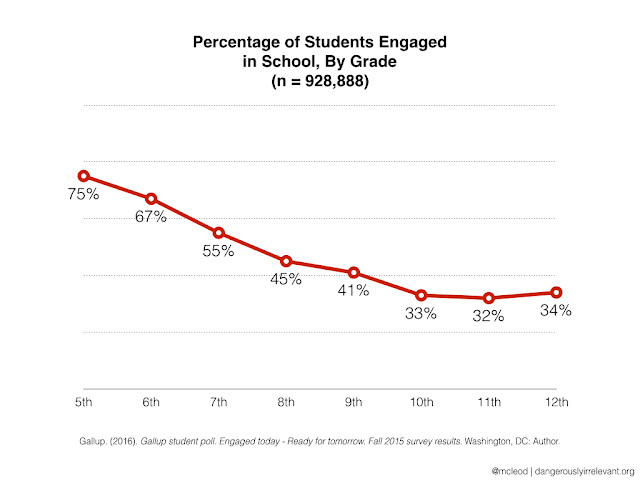 The chart below demonstrates just how students view their own engagement, as reported by Gallup. 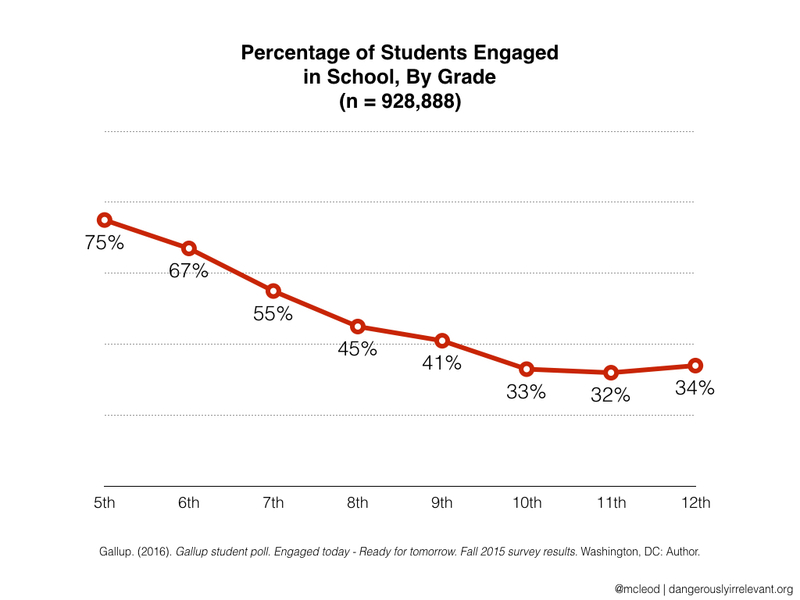 There is a consistent decline in engagement from 5th grade late into high school. These numbers are unacceptable to me. And even more concerning is my suspicion that apathy is possibly worse than even this data reveals. Many of our best students would report they are engaged, but if you really listen to the things they say about school, they primarily see it as a means to an end. They would likely report themselves as engaged, but not because they are enthusiastic learners so much as because they are willing to jump through the right hoops to get where they want to be. So I am on a mission to pursue excellence and crush apathy. And it starts with me. I need to examine the ways I am taking risks and how I'm pursuing excellence in my personal and professional life. I want to push out of my comfort zone to do the things that will accelerate my growth. 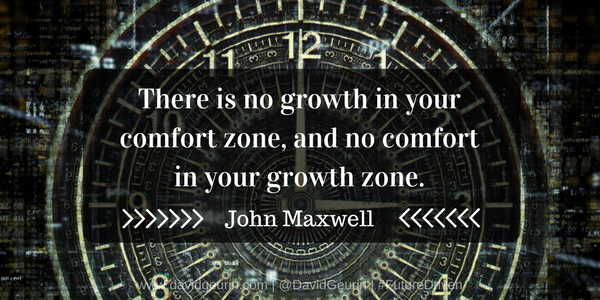 As John Maxwell writes, "There is no growth in your comfort zone and no comfort in your growth zone." I'm not interested in playing the game of school. I want to see high impact, meaningful experiences in everything we do. So in 2018, let's step out of the comfort zone and embrace the challenge of growth and excellence. 1. Passionate-A passionate, caring educator makes all the difference. Imagine what your school would be like if every person brought great passion every day. Craig Groeschel (@craiggroeschel) writes that apathy makes excuses, while passion finds a way. 2. Desperate-That word may seem surprising, but we need a sense of urgency about the work we are doing. Be desperate to see every student succeed. Bring that type of energy. 3. Daring-Be bold. Be audacious. Don't retreat from a chance to make a difference. 4. Determined-Nothing worthwhile is easy. It's a struggle. There will be challenges and obstacles. It's an uphill climb. Crushing apathy will take our deepest resolve. 5. Committed-We hear a lot about accountability in education. But apathy just hides from accountability. It does just enough. What we really need is more commitment, not more accountability. 6. Brokenhearted-It's possible to become hardened and even cynical as an educator. The challenges are immense. But I never want to lose a soft heart, a broken heart for students, colleagues, for all others. I want to exhibit empathy in each day. 7. Significant-I want to live a life of consequence. I want to make a difference. And I'm pretty sure you do too. The search for significance is shared by everyone. We want our lives to matter. But it won't happen if your own comfort is your priority. 8. Creative-Don't ever say you aren't creative. Everyone is creative. Every thought we have is a creation of our mind. You have ideas that the world needs. But you have to push them out there. Don't hide your creative light. 9. Extraordinary-The difference between the ordinary and the extraordinary is that little extra. 10. Courageous-Fear is one of the greatest things holding us back. We are born with only two fears, the fear of heights and the fear of loud noises. But we learn to fear so much more because we want to feel safe and comfortable. But it's not the way to crush apathy or pursue excellence. You have to be willing to put aside fear and pursue risk. 11. Curious-Start with questions. Question everything. Asking the right questions will push you out of your comfort zone as quick as anything. Growth is fueled when curiosity is flourishing in a learner. Are you willing to step out of your comfort zone in the coming year? What else would you add to the list? I want to hear from you. Leave a comment below or respond on Facebook or Twitter.